Triple Town developer Spry Fox has filed a lawsuit against 6waves Lolapps, claiming the iOS game Yeti Town is a "virtual duplicate" of its Facebook game. There's a lot of money to be made in the casual game business, particularly, it would seem, for those who don't care much about the principles involved in making it. 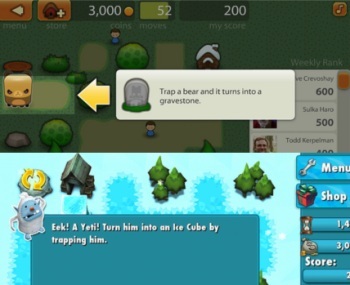 The latest company to stand accused of ripping off someone else's work is 6waves Lolapps, publisher of the iOS game Yeti Town, which in the eyes of Spry Fox is a little too similar to its Facebook game Triple Town. The sordid tale begins shortly after the successful launch of Triple Town on the Kindle, after which Spry Fox decided to "substantially enhance the game" and release it on Facebook and Google+. The studio approached 6waves Lolapps about handling the publishing duties on Facebook and, if it took off, other platforms; negotiations began but didn't go anywhere, leading Spry Fox to self-publish the Facebook version while continuing to discuss with 6waves Lolapps the possibility of bringing the game to iOS and Android. As part of those talks, Spry Fox granted Lolapps full access to its protected site, under the terms of a nondisclosure agreement, so it could fully evaluate Triple Town. But on December 20, 2011, more than six months after signing the NDA, Lolapps cut off negotiations and "unabashedly published a clone of Triple Town on the iOS platform" entitled Yeti Town. "Yeti Town is a virtual duplicate of the Triple Town game," the Spry Fox complaint says. "Rather than the bears as the nemeses to town building in Triple Town, Yetis perform an identical role. Saplings in Yeti Town perform identically to grass in Triple Town. Bushes in Triple Town are congruent to trees in Yeti Town. In Triple Town, trees are the third level, in Yeti Town, tents. The fourth level in Triple Town are huts, in Yeti Town, cabins. With this straightforward mapping of elements, rules are virtually identical as are the actions of the game in response to player inputs." "Just as with Triple Town, the application itself is distributed for free, however, users purchase from the iTunes App Store various advantages in playing the game that will allow more rapid completion of the tasks the game comprises," it continues. "These advantages were sold in the same manner, for the same quantity of 'virtual currency,' in the same amounts in the first public version of the Yeti Town game." On the day that Yeti Town launched, Dan Laughlin, the executive director of business development at 6waves Lolapps, sent a Facebook message to David Edery of Spry Fox apologetically acknowledging the similarities between the two games. "I need to back out of any further discussions on Triple Town. We've just published a game on iOS that you're not going to like given its similar match-three style," he wrote. "Wish this wasn't happening, but it is, and there wasn't anything I could do about it, despite my attempts." Amazingly, what ultimately spurred the lawsuit wasn't the game itself but a Gamasutra interview with 6waves Lolapps Chief Product Officer Arjun Sethi and Marc Tardif of 6waves-owned Escalation Studios, the developer of Yeti Town, defending the game from accusations that it was a rip-off of Triple Town. "There are a lot of other match-three games out there that are similar, and I think that being criticized like that is just part of a natural process," Sethi said. Tardif added that the decision was made to release the game in part because "there wasn't anything like it on the platform." That was a little too much for Spry Fox to let slide. "We believe that there is nothing 'natural' or ethical or legal about 6waves' behaviour," Edery told Edge. "What they did was wrong. And if they did get away with it, it [would] simply encourage more publishers to prey on independent game developers like us. We refuse to sit back and let that happen." Edery isn't commenting on the case but prior to the 6waves Lolapps interview and subsequent lawsuit he said that game cloning is becoming so common that it threatens to stunt innovation, as studios "make the safe choice of being iterative instead of totally original." "Cloning has always been an issue, but today it seems to happen faster than it's ever happened before," he said. "There seem to be companies that have risen in the industry with it at the core of their business model as opposed to something that unfortunately happens sometimes." Spry Fox is seeking an injunction against Yeti Town and any other materials that are "substantially similar" to Triple Town, as well as damages, Lolapps' profits derived from the game, legal fees and any other punitive smackdown the court feels like delivering.